Now offering it in Curved, the RIGID Radiance Plus Line is the perfect solution for those who want RIGID’s legendary quality at a level everyone can attain. Featuring improved LED technology, the Radiance Plus Curved offers more light output than ever before while consuming a fraction of the power compared to incandescent lighting. The RIGID Radiance Plus Curved is built with the same high-grade aluminum alloy housing as our legendary RDS-Series, but that’s where the visual similarities end. Inside, the Radiance+ and Radiance Line is feature-packed, with a black exposed printed circuit board, optimized forward projecting Broad Spot optics which combine the attributes of a spot and flood beam pattern, and recent updates in LED technology that boast up 7,128 raw lumens in the 20” size. Further, the Radiance Line has back-lighting available in white, amber, red, blue or green. The RIGID Radiance Curved light bar is for the customer who wants a truly custom look that only RIGID can provide. Even better, the Radiance Plus line now includes a Multi-Trigger Harness designed specifically for the Radiance Plus light bar. The RadiancePlus Multi-Trigger Harness also comes standard with two separate backlit LED rocker switches (red and blue), so each circuit can be used independently. 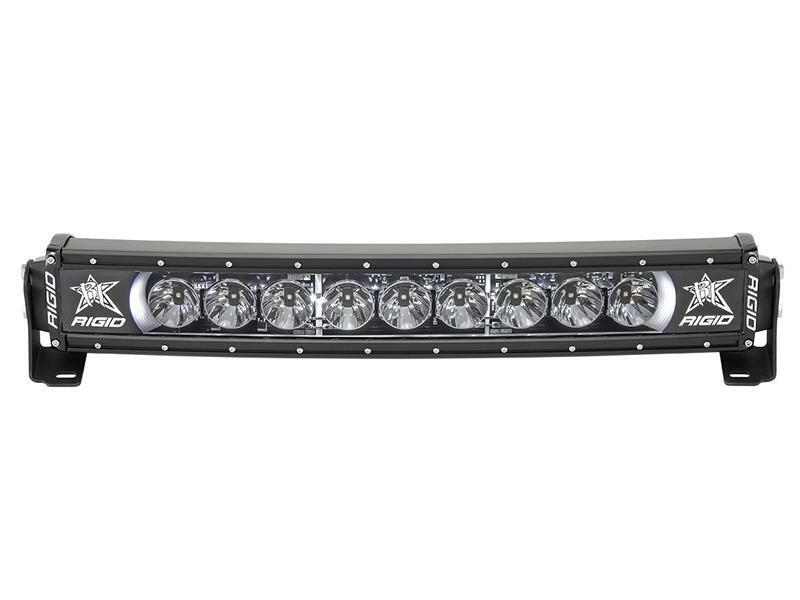 Radiance Plus Curved Light Bars are available in 20” – 54” lengths.